The Heart which we will be studying, unlike the heart represented in the picture above, is not our physical beating heart rather it is a part of our eternal and immortal makeup through faith in Jesus Christ. The same is true for the Mind. The Mind is not the Brain, but the Mind, which is eternal and immortal through faith in Jesus Christ, is very closely tied to our physical Brain which is mortal. "The Hebrews thought in terms of subjective experience rather than objective, scientific observation, and thereby avoided the modern error of over-departmentalization. It was essentially the whole man, with all his attributes, physical, intellectual, and psychological, of which the Hebrew thought and spoke, and the heart was conceived of as the governing center for all of these. It is the heart which makes a man, or a beast, what he is (Prov 16:23, 23:7; Dan 4:16), and governs all his actions (Prov 4:23). Character, personality, will, mind are modern terms which all reflect something of the meaning of 'Heart' in its biblical usage. The heart, leb/ lebab, in the OT refers to the whole inner person, and is distinct but not separated from the soma, the physical component of man. In its fullest sense it is a broad entity that encompasses a wide range of functions, including but not limited to the faculties of thinking, judging, understanding, and conscience – those that are most often associated from the NT onward with the mind. In accordance with this OT understanding, the LXX, communicating biblical truths to Greek speaking Jews, deemed the heart as the organ of noein – thinking, judging, understanding, and willing (Jn 12:40; Is 6:10). 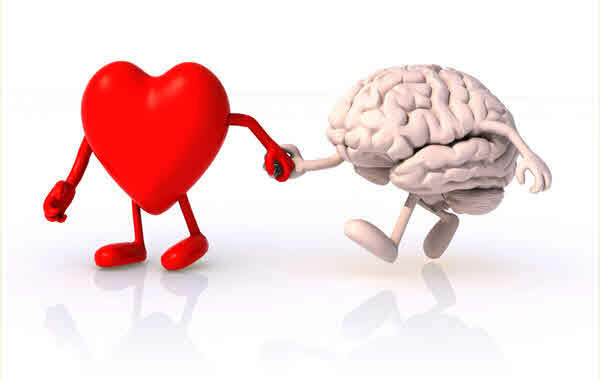 From a NT perspective, the Greek term nous or mind represented the intellectual or cognitive aspect of the OT concept of the heart. This is demonstrated when Jesus quotes to His NT audience the first and greatest command of Dt 6:5, “…you shall love the LORD your God with all your heart, and with all your soul, and with all your mind, and with all your strength (Mk 12:30).” Everyone present, including the Scribes, accepted his quotation as the word of God (Mk 12:33), even though His quotation includes a fourth noun (mind) not present in the original Hebrew text. Far from adding something new to the Scriptures, Jesus use of the term “mind” emphasizes a particular intellectual aspect or agency of the heart that is understood to be present in the original Hebrew text in Dt 6:5. As such, the mind is not an agent or a faculty of the physical brain, which, for the Greeks, would have been identified with the soma, but rather it is an agent or faculty of the heart as defined by the OT. Jeremiah 17:9 — Is It True of the Believer? Jeremiah 17:9 may be one of the most famous verses in Scripture. There’s hardly a week that goes by that I don’t hear reference to or personally think about it. Our experience struggling against our own temptations, desires, and unruly emotions, and helping others with the same, tells us that the vivid language of this verse is accurate. Our hearts truly are deceitful and desperately wicked! Biblical counseling likes this verse because of the accurate theology of the heart it teaches. It removes our naivety. It strips us bare with its blunt language. It penetrates literally to the core of our being. Unlike the secular psychologies we believe there is a desperately wicked problem with the human heart. For these reasons, we believe it is a crucial verse to understand. However, for the purposes of this article, I would add that it must be properly interpreted. If it is not properly interpreted and taught it can easily be used in an out-of-balance way. We could lead Christian counselees to believe that this is their current condition. But Does It Apply to the Believer? Let’s use these questions to guide the rest of our discussion. Just because we can relate to the language experientially and just because it teaches an accurate theology of human nature does not mean that we should relate this verse to ourselves the same way it applies to unbelievers. It is vital that we not allow our experience to be the interpretive guide. As believers we must not only understand the immediate context and the greater context of Jeremiah, but also how the New Testament answers our questions. It is easy to focus in on one tree so much that we lose sight of the forest. Of all people, biblical counselors should be accurate in Bible interpretation since our main guide is the Scriptures. If we misinterpret it we are misusing the tool that guides us. Inaccurate interpretation would mean it is not truly biblical counseling! Let’s think about the immediate context, the larger context of Jeremiah, but then how the New Testament helps us understand this verse. For the sake of space I will not be writing out the verses but will rely on you looking them up for reference. This is a classic text about God’s people caving into idolatrous “peer” pressure even to the point of child sacrifice (as hard as that is to believe, see verses 1, 2, and 5). He further contrasts the person who is trusting in the LORD with those who are idolatrous (verses 5-8). If child sacrifice doesn’t reveal the condition of humanity, what does? He then says the heart (the inner man of our mind, will and emotions) is deceitful (an insidious supplanter) and desperately wicked (it has an incurable wound, see also Jeremiah 15:18). Is this true of humans is not the same as asking, is this true of believers? We need to be more nuanced. Is it true of humans is an easy one to answer. We see these attitudes and actions coming out of the inner person as reported on the evening news every day! But we must nuance this more for believers in light of what is promised in the New Covenant. Could it be that Jeremiah purposely addresses it in juxtaposition to this passage? Jeremiah 31 looks even more beautiful against backdrop of 17:9! Our Lord referenced His New Covenant when at the “last supper” He said, “This cup… is the new covenant in my blood…”(see Luke 22:20). He was initiating something new and part of the new is a new heart (Ezekiel 36: 26 and Jeremiah 31: 33). This raises the question then, “If I have a new heart in Christ why do I still sin?” Answering this question will help us understand the nature of the New Covenant heart and the believer’s relationship to Jeremiah 17:9. I believe it can be demonstrated that the constitution of the New Covenant heart is not perfect but in progression because the New Covenant being fulfilled is also progression not perfection. It is between the “already and the not yet.” It is not black and white but a gradation from black to white with lots of shades of gray in between! Are there remnants of the insidious supplanter and the wound? Yes! But are we being healed? Yes again. Because of the New Covenant we have a new disposition. We have a new inclination. We have a new ability to fight sin and even desire to do so. But even with the new inclination there is still “remnant” sin. There is still remnant “deceitfulness” and desperate wickedness in my soul. I am not totally pure (boy, do I know it!). This understanding that the heart is already and not yet is demonstrated in the clearest Pauline passage about the New Covenant. In 2 Corinthians 3 Paul contrasts the inferiority of the Old Covenant with the superiority of the New Covenant. This had to be thrilling for Paul as he realized that what Jeremiah and Ezekiel had prophesied had come true and was coming true. The progressive nature though is clearly explained in the last verse of the chapter where Paul states that we are “being transformed from one degree of glory to another” [emphasis added]. My inner person has a new leaning progressively (away from self and toward God and others). It has a new disposition (instead of worship of self, worship of God). It has new desires (instead of fulfilling its own wants it progressively asks what can I do to please God). Instead of seeing how much fame it can accumulate for self it progressively asks how can I make God famous? This is the New Covenant being fulfilled in a progressive way. If we do not answer the questions I have posed there can be extreme discouragement or naivety. Both would be the result of misunderstanding the doctrine of progressive sanctification or the already and not yet aspect of the new covenant and the new covenant heart. In other words, Yes, I have a new heart in Christ but the way He made this heart is that there is an already and not yet aspect to it. The naivety and discouragement could be in a number of directions. If someone believes this verse in no way applies to believers then there is naivety of remnant sin (e.g. those who tell us that since we have a new heart in Christ we can trust inner passions and desires). This person would misunderstand the progressive nature of the New Covenant. On the other hand, if someone uses this verse without qualification or implies because of lack of clarification that it applies to believers, he or she would be guilty of under emphasis of our new position in Christ. So, use this verse in counseling to teach counselees about the heart and even the immediate context to teach about the tendencies of the heart to “trust” in man which leads to idolatry (verse 5). But, as much as you emphasize the tendencies of the heart toward deceitfulness and desperate wickedness please emphasize the New Covenant as well. Make sure to talk about the fulfillment of the New Covenant in the book and how the constitution of the heart has changed and is changing according to chapter 31 and also 2 Corinthians 3:18. Most importantly, worship because of the Gospel and what God has provided and is providing to change us! Dr. Paul Thorsell (Professor of Theology, The Master’s College) helped sharpen my thinking through his dissertation titled, “Spirit and Law in the New Age: A Study of the Pauline Conception of the New Covenant” (1991). Page 117 of Dr. Thorsell’s dissertation. In Christ we have the mind of Christ (1 Cor 2:16 ESV). Since in this world ground zero in spiritual warfare is the battle for our minds, we are instructed in scripture to take captive every thought to the obedience of Christ (2 Cor 10:5 ESV).